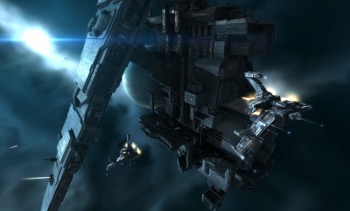 An Eve Online player recently revealed his true self by committing one of the game's grandest thefts ever. Eve Online schemes are nothing new, but they always remain interesting, especially when enormous enough. In one of the biggest thefts to ever hit the game, the leader of the Titans 4 U investment opportunity has stolen and dissolved all of its assets for a cool 850 billion ISK (in-game currency). To define what this number means, last month a couple of players inadvertently blew up 74 PLEX, an in-game item that can be redeemed for game time, worth 22 billion ISK and about $1295. 850 billion ISK could purchase 2575 PLEX, worth $45,000 according to Massively. That's noticeably more. Titans 4 U was run by "Bad Bobby" since last summer and was thought to be completely safe against this type of pilfering. As we now know, nothing is ever safe in Eve Online. The investment venture held items such as several valuable in-game blueprint original copies as well as 156 billion ISK. The blueprints were locked down and were only supposed to be released by the vote of five of Titans 4 U's shareholding members, ensuring that Bad Bobby would never be able to get at them by himself with less than 50% of Titans 4 U's shares. Everything went wrong for investors when Bobby initiated a vote to add more shares and more trustees. This actually ended up providing more shares to Bobby, not to new trustees, and he now had enough to unlock the Titans 4 U fortune by his lonesome. Billions of investors' ISK were now in the hands of Bad Bobby. Massively calculates that 850 billion ISK would be able to keep an Eve Online account running for 214 years when used to buy PLEX. I've never played Eve Online myself, but it truly sounds like an awesome game to play if you want the experience of embezzling billions, without any real world consequences.